I have created a Powershell gui script for mapping a drive for a client with a timer to disconnect after 1 hour. Using the timer control sample in the tutorial. The issue I'm having is the timer is starting during form load and not when the button is clicked. What happens is if the the button is clicked after the timer expires then script process immediately to the end Any help with this would greatly be appreciated. I have searched and been beating my head on this for days now. No - you are in the correct place. 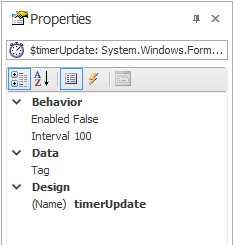 Just set the properties of the timer to enabled =$false and the timer won't start. I suggest using a timer control and keeping a list of drives and time and just test the time. Thanks for the reply. The properties are set to false. The timer does not start until you tell it to. If it is running when the form opens then you have enabled it in code or in the designer. You say the "properties" are set to false What properties are you referring to? Thanks for the help. I've gone through all the code I don't see it anywhere else. Well you may have broken code in your project. Try starting a new project and adding the code a little bit at a time.